Grape and cherry tomatoes are a great garden choice for kids to grow. You can pop them whole into your mouth right out in the garden! Or bring them inside for snacking, cut them in half for salads, and so forth. But most of these mini-tomato plants are very productive. What happens when you grow more than you can possibly eat, fresh and raw? Make these tasty snacks, which are like large, spicy raisins. Preheat oven to 225 degrees. Line cookie sheet with parchment paper. 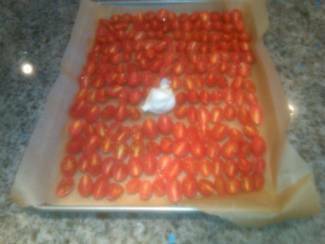 On cutting board, cut each mini-tomato in half. Place side by side on the cookie sheet. In the midst of the tomato halves, place one or two whole garlic bulbs. The oven's heat will draw garlic taste up into the oven's interior and place just enough garlic taste on your mini tomatoes to be delicious without overwhelming the tomato taste. When the tomato halves are lined up, sprinkle lightly with no more than 2 T. olive oil, plus a little thyme, sea salt and freshly-ground pepper. Bake for 2½ to 3 hours. Check after 2 hours; if some along the edges are beginning to get too crisp or burn, remove them and keep baking the others. Eat right away or store in the refrigerator in a jar or container with a little extra olive oil dribbled on top. Shake the container to mix. Or you can store these in a freezer container to enjoy next winter with some hot pasta!